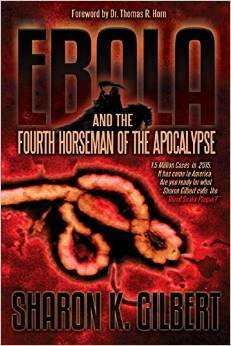 Ebola and the Fourth Horseman of the Apocalypse. In this episode, Dr. Lake discusses the current Ebola scare and its connection to the Book of Revelation with Sharon Gilbert, the author of Ebola and the Fourth Horseman of the Apocalypse. This episode in packed with important information that every believer should have! Death rides upon an evil wind, and Hell follows with him; that is the grim scenario facing the world today. Biblical Prophecy is playing out in our daily headlines headlines which change minute by minute, hour by deadly hour, and it is growing clearer with each passing day that the world is simply not ready. Sharon K. Gilbert calls this event the Blood Snake Plague , because Ebola, when gazed upon through the clarifying lens of an Electron Microscope has a peculiar, linear, curving, reptilian appearance. This infinitesimally small virus, just 1/100 the thickness of a human hair, has but one plan: Hijack every human cell and force them to produce more Ebola virions more blood snakes, which in turn infect more humans until there is not one human left alive. That is the enemy s plan. That is why the Rider is given authority over the Earth, but God Himself restricts the enemy s plans and grants him the power to slay only one quarter of all mankind. Are you ready for the Rider and his Hellish Companion? The Blood Snake is his weapon, and it is a thirsty weapon thirsty for human blood. The enemy wants a bloodbath. Jesus Christ has given us prophecy so that we can warn others, and He wants us to be prepared. Are you? Sharon holds a degree with honors in biology from Indiana University, where she followed the molecular biology and genetics track within the department. Her doctoral work in physiological optics was cut short when she met and married her husband and fellow writer, Derek P. Gilbert, causing her to relocate from Bloomington to St. Louis. Since then, she has written numerous fiction and non-fiction works and—along with her husband—co-hosts one of the longest running podcasts on the Internet, PID Radio, which began in March 2005. Sharon has also studied Bible prophecy for over 50 years, concentrating on the etymology of original languages to uncover as yet ‘hidden’ references and clues. In EBOLA AND THE FOURTH HORSEMAN OF THE APOCALYPSE, Sharon deciphers the complicated language of original Ebola research as she unlocks Bible prophecy to reveal what is heading our way—in a very short time.